The Rotating Biological Contactor (RBC) is a fixed film biological secondary treatment device. 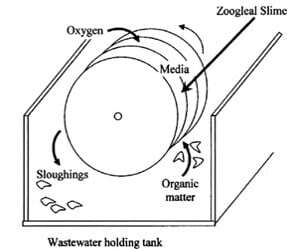 In operation, a media, consisting of a series of circular disks mounted side by side on a common shaft is rotated through the waste-water flow. 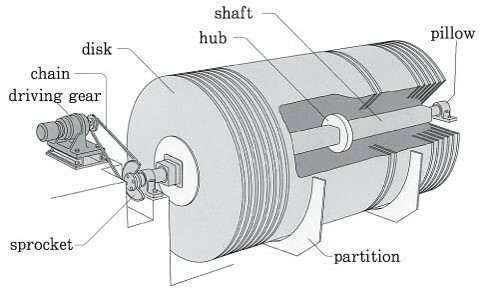 The shaft continually rotates at 2 to 8 rpm, and a layer of biological growth 2 to 4 mm thick is soon established on the wet surface of each disk. The disk continues to rotate, leaving the waste water and moving through the air. During this time, oxygen is transferred from the air to the slime. As the slime reenters the waste-water, excess solids and waste products are stripped off the media as sloughing. These sloughing are transported with the waste-water flow to a settling tank for removal. During operation, observations of the RBC movement, slime color, and appearance are helpful in determining system performance; that is, they can indicate process conditions. If the unit is covered, observations are usually limited to that portion of the media that can be viewed through the access door. First day cod level remains low in the effluent but after a period of 75-100 days effluent quality start deteriorating as a result of washout of detached biomass. Some bacteria like pseudomonas removed from fixed film system as they do not stick on the film. Nitrification-de-nitrification is one of the most widely accepted biological solutions to the problem of nitrogen removal from high strength nitrogenous wastewaters due to its efficiency and economy. Nitrification is a two step sequential aerobic oxidative pathway for the oxidation of ammonia to nitrate, resulting in release of energy. The reaction is carried out by autotrophic bacteria belonging to the genera nitrosomonas (oxidizing ammonia to nitrite) and nitrobacter (oxidising nitrite to nitrate).De-nitrification is an anoxic\anaerobic reductive pathway for the conversion of nitrate to nitrogen gas. This reaction is carried out by bacteria belonging to genera bacillus, pseudomonas, achromobacter, micrococcus, etc. However simultaneous nitrification- aerobic de-nitrification system in a single stage using a mixed biofilm culture of thiosphaera pantotropha can also be used. Thus eliminating the requirement of a separate anoxic reactor for de-nitrification. Coloured industrial efﬂuents can be effectively treated by immobilized phanerochaete chrysosporium in a continuously operated RBC reactor following its dilution with media containing nutrients and sugar, preferably glucose. Cod removal efﬁciencies in the various stages of operation in the reactor were also found to match well with the decolourization of the wastewater. 5gmbod/m2.Day . So to get maximum application the loading should be in some limits. Short contact period are required due to large active surface area. Capable of handling of wide range of flows. Sludge has good settling characteristics. Requirement for covering rbc unit to prevent algea growth and freezing in northern part of india. Shaft bearing and mechanical drive units require frequent maintenance. Continuous supply of electricity required.